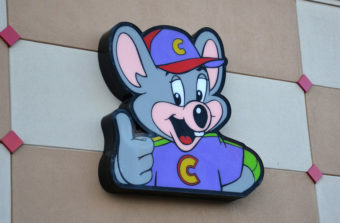 If you’ve never had the pleasure of dining in a Chuck E. Cheese’s restaurant before, imagine for a moment an unending assault on every single one of your senses at once while a giant robotic rat mocks your existence with a dead, lifeless stare and you’ve basically got it. Conceived by Atari co-founder Nolan Bushnell, much like Atari itself (see our article here) Chuck E. Cheese’s more or less bumbled its way to success, inadvertently helping to change the landscape of American family dining in the process. After a little research, Bushnell concluded that maximising profits from arcade games and the like was all about securing a location and having a captive audience- two things he reasoned he could easily achieve with a restaurant. Bushnell’s idea then was to create a restaurant where food was, as he described, “an ancillary service” and the real draw was the games and entertainment. Essentially, he wanted to create something similar to a casino in Las Vegas (food, games, and other entertainment), but for the whole family. To this end, Bushnell decided that his restaurant should sell pizza, reasoning that it would be impossible to screw up such a simple foodstuff as long the ingredient were good. This was important as he noted he really had no idea how to run a restaurant business, so keeping it simple was paramount. A secondary reason Bushnell decided to sell pizza instead of, say, fast-food style burgers and fries, is that pizza has a built in “wait time” once ordered- time that could be spent playing the multitude of arcade games he planned to outfit his restaurant with. The reason for doing the animals, believe it or not, was not for the kids. It was meant to be a head fake for the parents. Kids are really smart at knowing how to play their parents. and the kids knew that if they said, ‘I want to go to Chuck E. Cheese and play the games’ the parents would just see themselves spending money. But if they said, ‘I want to go see Chuck E. Cheese entertainment — and it’s free,’ they’d be good to go. The other thing was that we wanted the parents to have something to amuse themselves while the kids were in the game room. If you listened to the dialogue, it was fun, edgy stuff, kinda like Toy Story, written as much for the parents as the kids. Bushnell eventually settled on having this entertainment meted out by animatronic animals after a trip to the Tiki Room in Disneyland and reasoning that making a robo-animal rap or tell a joke would be child’s play for his engineers. Amazingly the scheme worked, and the chain exploded in popularity. Even after a pretty catastrophic fall in much more modern times when the games and entertainment there became more than antiquated, the company still managed to sell for just shy of $1 billion in 2014, with the new ownership taking steps to modernize the whole affair, and well over 600 locations still in operation world-wide today.